Fossils, some whole some fragmented, cemented by a spar matrix (crystalline calcite). 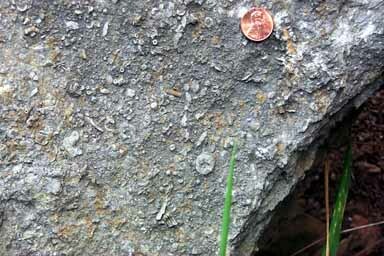 Most of the fossils are crinoid stem fragments, but favositid (honeycomb) corals and stromatoporoids are also common. These are mostly crinoid stem fragments. Crinoids, also called sea lilies, are echinoderms (related to star fish). The calyx (body with feeding arms) was supported above the bottom on a stem composed of small calcite discs stacked together similar to a stack of pocker chips. When the animal died and decayed the individual stem discs would separate and be washed around on the bottom. Here we see a scattered collection of various size discs, some on end view (appearing round) and some in side view (appearing rectangular).